LAS VEGAS (Reuters) - A gunman who was part of a husband-wife team who killed two Las Vegas police officers in a weekend pizza restaurant ambush was shot and killed by police, not by his wife in a murder-suicide as first stated by authorities, police said on Wednesday. 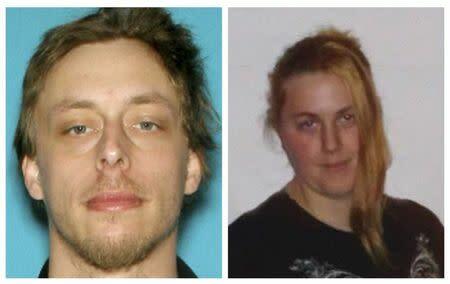 The couple, who police said harbored anti-government and white supremacist views, gunned down the two policemen as they ate lunch on Sunday, then made their way to a nearby Walmart store where they killed an armed bystander who tried to stop them, authorities have said. Las Vegas police initially said that the couple - wounded and surrounded by police - had died in an apparent murder-suicide after the wife, 22-year-old Amanda Miller, shot her husband multiple times before turning the gun on herself. But police said on Wednesday that 31-year-old Jerad Miller was killed by police, and cited as a source of possible confusion surveillance footage that appeared to show Amanda Miller raise her gun toward her husband just after he was shot. Amanda Miller shot herself seconds later, they said. "His death was ruled a homicide as a result of police gunfire," Assistant Clark County Sheriff Kevin McMahill told a news conference. McMahill said three responding officers had fired their weapons during the standoff, but police do not yet know which officer was responsible for Jerad Miller's death. Information about the suspects gleaned from police and social media painted a picture of a pair with increasingly extremist views on law enforcement, culminating in a Facebook post a day before the shooting warning of the "dawn of a new day." Investigators have not yet found any links between the couple and extremist groups, and McMahill said police believe the pair, married in Indiana in 2012, worked alone. Police said the Millers had expressed support in social media for renegade Nevada rancher Cliven Bundy, whose property was the scene of a high-profile April standoff between federal agents and Bundy supporters over a forced round-up of his cattle from public land. The Bundy family said on Tuesday the Millers were at the protest site for a few days but were asked to leave after other demonstrators expressed concern about Jerad's "aggressive nature and volatility."